Caregiving is a long standing tradition in the African American community. This book provides historical and contemporary insight into caregiving. The authors intertwine the African American struggle for dignity and social justice with their discussion of various aspects of caregiving. An overarching theme of the book is the resilience of African Americans in carrying out their caregiving responsibilities. Although disparities are a part of the caregiving landscape, the authors individually and collectively present a rhythm of caregiving that engages the reader in caregiving across the life span. This in depth look at the African American caregiving experience exposes readers to a broader lens, thus avoiding the often overly simplistic view or culturally limited view of their caregiving experience. 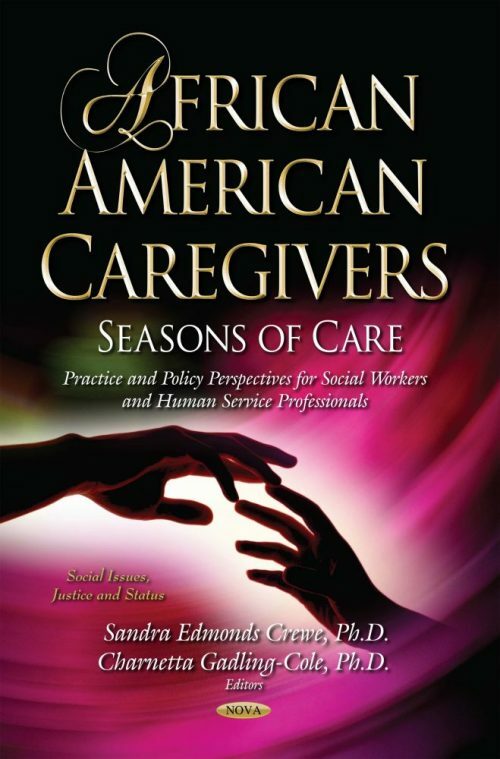 Caregiving is not limited to any particular group—the old and the young are a part of the caregiving experience that is discussed in this book. The book is a collaboration between social work programs at Historically Black Colleges and Universities—Howard University (Washington, DC) and Alabama A&M University (Normal, Alabama). The book includes a wide range of content, from caring for older persons with dementia to younger disabled children. The authors/contributors also range in age and experience as caregivers. All of the authors have extensive experience working with African Americans. These are authentic accounts of the caregiving experience within the African American community. The book is authored by social workers who reflect the core values of the profession. Interwoven throughout the chapters are the National Association of Social Workers’ six core values of service, social justice, dignity and worth of person, importance of human relationship, integrity and competence. Additionally, the authors emphasize the implications for practice and policy in their unique contributions. Social workers as well as other human service professionals will find the book useful in their practice. Also, this book is especially suited for students who are working with the different populations discussed by the authors. For example, social gerontology classes will benefit from the chapter that specifically focuses on older persons and caregiving. Similarly, students focused on mental health service delivery will also benefit from the rich discussion of well-being, spirituality, and resilience. Students can use the text as well in practice and policy courses.